United RC has just released a large scale RX Battery pack for the HPI Baja. 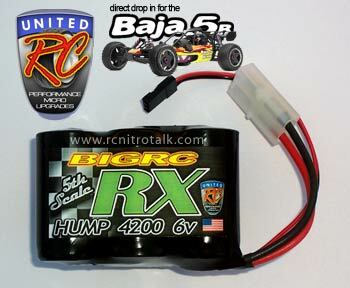 The new HPI Baja 4200 RX Pack is a 3×2 hump setup with 4200mAH Sub-C NiMH batteries. United RC known for their awesome micro (1/18th) battery packs has extended their industry leading battery pack quality to other RC genres. United RC Gas RX NiMH battery pack line offers two configurations, providing 5th scale RC drivers the RX options they need. Whether you run FG or the HPI Baja, our packs provide LONG runtimes and charging convenience. Built with High Discharge 4200mAh Sub-C NiMH Cells. Professionally built pack, you can be assured that the quality is in every pack! 3×2 hump configuration, a direct drop in for the HPI Baja. Strong hand soldered from cell to cell, providing the best contact and power transfer. Wrapped in our famous black wrapping, completely sealing the pack and protecting the cells. NO EXPOSED CELLS! Packs are cycled prior to shipping â€“ eliminating DOA packs! Note: Packs do not include connectors. If you would like a connector, please be sure to purchase one, and United RC will install it for you. If you do not choose a connector, United RC will install 18g wire leads. Discuss the new HPI Baja 4200 RX battery packs in our Large Scale R/C’s forum.